Forcefeed to Concede is my Bant mill deck where Overflowing Insight is also a star. It works well with an enchantment called Induced Amnesia . Isn’t milling the greatest? This is a forcefeed mill deck that absolutely wrecks people. It’s a lot of fun to play. 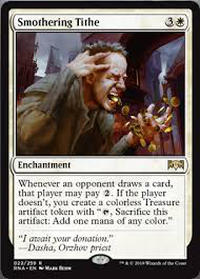 It uses a combination of Smothering Tithe , Overflowing Insight and Induced Amnesia to force my opponent to draw his whole deck. Games typically end with my opponent conceding, hence the name Forcefeed to Concede! I could really use some help developing the sideboard though. What does this deck need? What is it weak against? Your help is appreciated. Normally people between 36-40 lands, right? I'd say this one wants 38. Couple especially good ones: Myriad Landscape and Ash Barrens. If you're serious about the token theme, maybe also Westvale Abbey Flip. You might also consider these cheap spells: Preordain, Telling Time and Serum Visions. Truth or Tale also seems hilarious, especially with a little politicking. 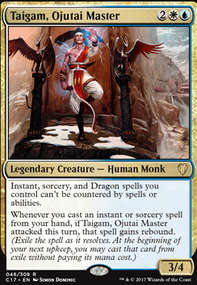 I really like your choice of a bunch of modal cards (with odd mana costs, obviously) that can do a bunch of different things. 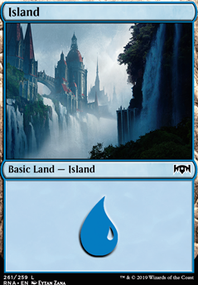 I would add a couple more - Righteous Confluence is less popular than the blue and black ones but still pretty good (life sometimes matters a lot in Commander, this gains 15). I STRONGLY suggest the Scry temples from Theros block. Temple of Silence, Temple of Deceit &Temple of Enlightenment all help you control the top of your deck and your colors. Isolated Watchtower is also pretty freakin good in your deck as green decks will often ramp, so it should often be live. Some pretty good ones from EDHrec that contribute to your strategy: Prognostic Sphinx, Windreader Sphinx Angel of Serenity Luminate Primordial and especially Conundrum Sphinx Penance and Future Sight. Those last three, I really would try to find room for (holy damn, especially Penance). 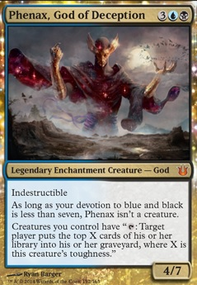 Grave Betrayal, Entreat the Angels, Terminus, Overflowing Insight, are good bigbois that work (in different ways) with Yennett. 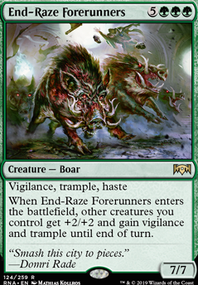 Then a couple general comments - you should probably try to include 2-3 sweeper effects and maybe 3-5 point removal (for a creature, I mean) effects, and a few effects that hit other permanent types (like Anguished Unmaking and Utter End). 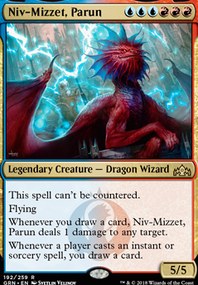 I think you'll probably want to include most of the cards I mention above that mention card draw, because it's REAL important to not get stuck on lands in EDH, and card draw's really a good way to avoid that. A few cards that I think would be good cuts: Dowsing Dagger Flip, maybe Anointed Procession depending (you probably would want 20-30 token effects to justify this), Aphetto Alchemist, Lich Lord of Unx also because it's expensive, Master Trinketeer which has an activated ability that's way too damn expensive, Retrofitter Foundry which again is way too expensive, Sram's Expertise is probably too low impact - Righteous Confluence would be a great replacement here, for example, Connive / Concoct and Discovery / Dispersal are both a lil underpowered too. Those are some thoughts for now - looks real fun though, isn't this commander's complexity so nifty? There are a number of ways of going about this, but, your deck needs to be doing more things at more points in time during the game. 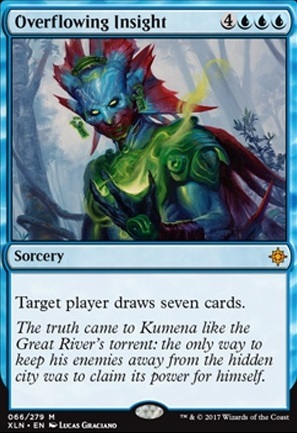 First of all, I recommend cutting Dive Down (or at least cutting one copy) as you only have 7 creatures before the hostage taker effect so sometimes this is just a dead card. Next I recommend leaning more into Psychic Corrosion. 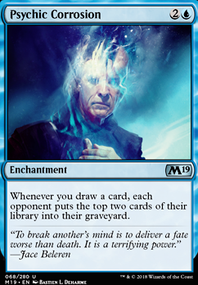 This could be done by replacing the underperforming Navigator's Ruin and extremely expensive Overflowing Insight with cards like Chemister's Insight and more control spells. When you land a Patient Rebuilding the clock will already speed up as the extra cards drawn will trigger more mill from your corrosions. Finally, Thief of Sanity is fun but generally lackluster. If you could replace him with a better blocker you may see improvement, though maybe a black kill spell might assist this endeavor. Hopefully the deck improves! I think I will keep 2x Teferi, Hero of Dominaria and 2x Chemister's Insight to keep it more balanced and save a little money, However I did take you advice and replaced Overflowing Insight with Chemister's Insight since, like you said, it is at instant speed and can be cast again from the graveyard. Thank you OberstHati for the suggestions; They were helpful. Thank you OberstHati for letting me know which cards were not standard and giving me suggestions on what to replace them with. For the most part I replaced everything you suggested However, I added Overflowing Insight instead of Chemister's Insight because I wanted more draw late game. 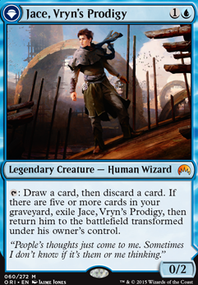 You mentioned adding a play-set Teferi, Hero of Dominaria, but I do not see how he is relevant in this deck. I already have enough draw power and he is not a win-con. Why should I put him in my deck and which cards should I replace him with?